Roger Moore will forever be remembered as James Bond, but he was also Ivanhoe. I have not much concrete memories for the television series, but I do remember wanting to be Ivanhoe in the period the series were broadcasted. That must have been before Batman, because I also remember that I used my Ivanhoe cape for a Batman cape. 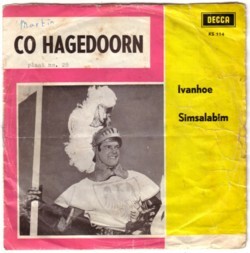 The Ivanhoe tune was released on record in a Dutch version, sung by Co Hagedoorn. 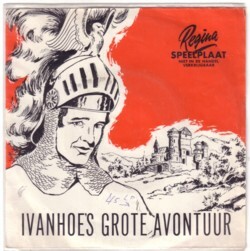 (He had another 45 out that is much better, De reus van het woud , but sorry, this is about Ivanhoe only.) Many people my age have warm memories of this song and in the 90’s a Dutch Ivanhoe Club was formed. There are Ivanhoe Clubs in other countries too, of course. 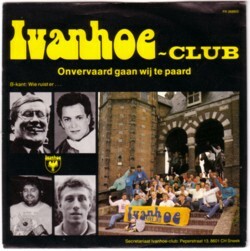 The Dutch Ivanhoe Club was very active for a while and even released two 45’s. One with the club members singing a new version of the theme song, and one with a new composition, Net als Ivanhoe . A nice idea, but musically not very impressive records. In the 60’s, records with stories for Dutch children were hard to find. I had only a handful of 45’s back then, and I was lucky. Today these records are still not easy to find, but at least I know what I am looking for now. Of Ivanhoe there are at least two 45’s and one LP with hear plays. One of the stories was also released on an advertisement record for Regina. The fact that there was no budget for these productions makes it difficult to take it serious when you listen to it now. Three actors, one sound effect, no music and probably not much time for rehearsals before the studio’s recording light went on. When my son discovered the LP he wanted to hear it, and my attempts to explain why he would not enjoy it were probably only adding to his desire. I made him a tape and to my surprise he listened to it several times. I will not bore you with the stories, but here is Co Hagendoorn with the tune. 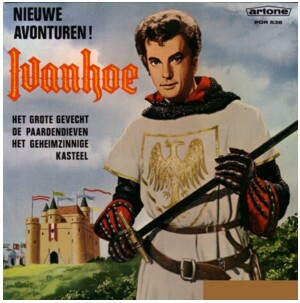 Ivanhoe (Roger Moore)war meine erste Liebe. Ich war ca. 8 Jahre alt, als die Serie im deutschen Fernsehen am Sonntag lief. Alle mußten warten, bis der Film zuende war, dann erst ging die Familie spazieren. Ich hatte Roger Moores Bild unter dem Kopfkissen. Auf dem vrijmarkt in Lonneker am 30.4. habe ich ein altes Ivanhoe-Buch gefunden mit Roger Moore vorne drauf. Ein schöner Mann! hello, I search for a photo of the costumes of Ivanhoé to reproduce it someone could say him me or to find one of it.